Wanted to share the experience of getting both my car and my dads car tuned by Evolve. I myself was part of the Evolve tune group buy recently. During this time my dad and I were looking for a solution for his emissions test coming up this year (he is catless). I then took my car to dyno (that i had previously dyno'd on last year stock), to see what i was now putting down with the evolve tune. There were some gains, but overall it wasn't as an increase as i had hoped for. But with no monitoring of IATs or anything, there could be numerous reasons why these results as a comparison could be skewed. After some discussion with Sal, we decided to take my car to my dads dyno day and put it on the dyno to do a better comparison. I loaded up the stock tune so i could dyno it first. When dyno day arrived, we left bright and early for our 2 and a half hour drive to the dyno shop. We got my car strapped down, and after some delay in getting the datalink module working properly, we did some pulls, sent the logs* to Sal, and 15 minutes or so later I downloaded/loaded the new tune, and made some very impressive gains. 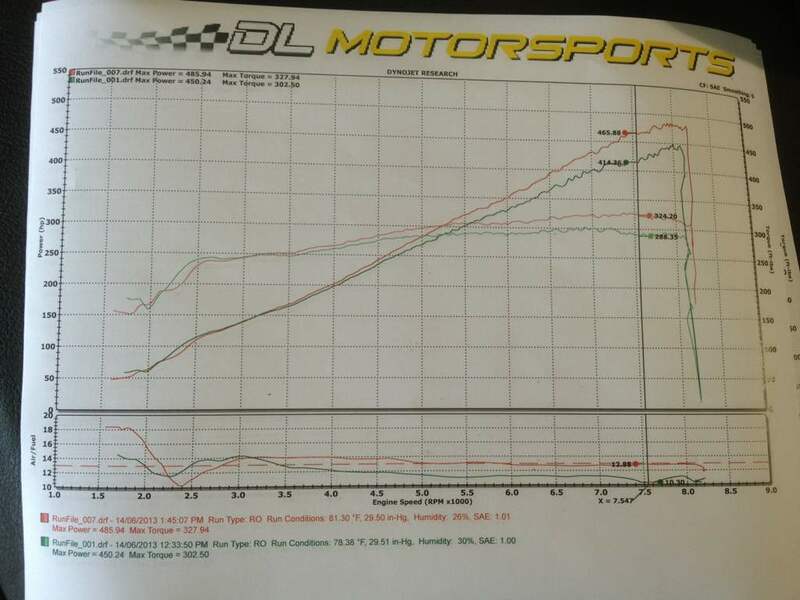 I was very happy with these results (stock tune vs final evolve tune). With my car all done, we then strapped down my dads car. His power mods are: VF stage 2 (making about 9 psi at peak), Evosport Headers, CPI RT section 1, and RE El Diablo muffler. I won't get into the specifics of VF tune, but now i know why the gas tank is always on empty :shifty:. Peak gain of over 50whp! Doing some partial throttle tuning next week. I haven't driven his car since the tune yet as we encountered a LCA issue at the dyno shop, but from what my dad says he can definitely feel more power and better driveability. Will provide more feedback as the miles go up. Want to thank Sal and company at Evolve, as well as Mike at DL Motorsports in Burlington, Ontario, Canada. Last edited by bluewater87; 06-16-2013 at 07:00 PM. 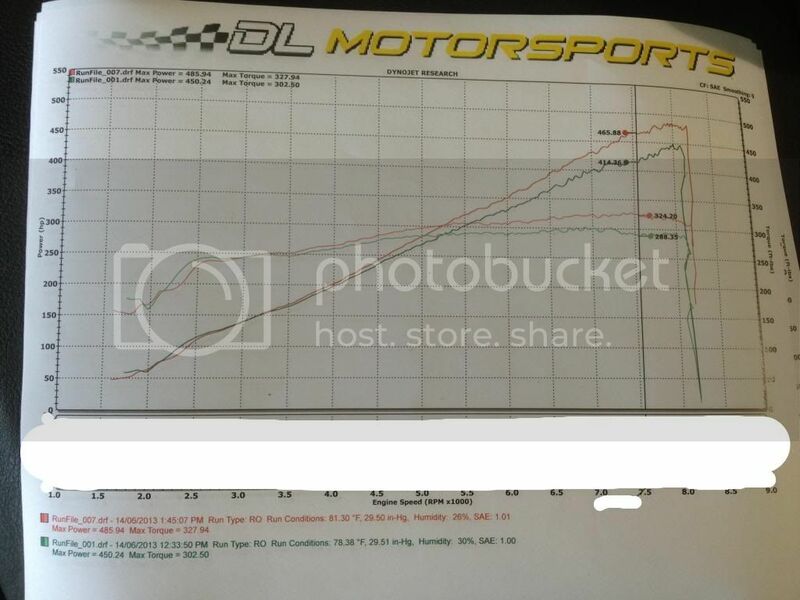 So on this dyno you put down basically the same numbers with the stock tune that you put down last weekend at the dyno day with the evolve tune, interesting, heartbreaker dyno for sure lol. I made 285whp on both dynos on the stock tune. Evolve sent me a new tune after I sent them the logs of the dyno run at DL. So the difference was in the tune, not the dyno. 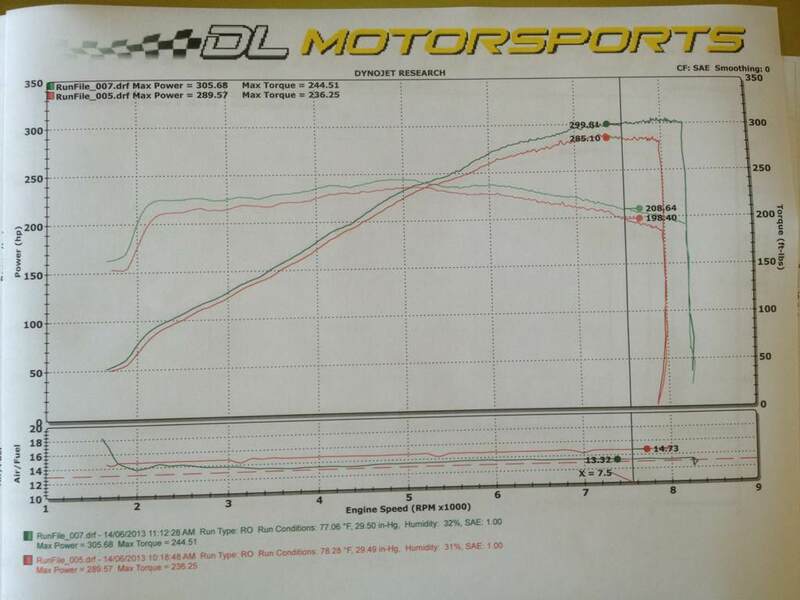 Edit: my dads car dynoed 463whp on a third dyno on the vf tune, vs. the 450whp at DL motorsports, So either both Tag and DL have low(er) reading dynos OR the third dyno has a high(er) reading. But you're right, unless there are other conditions that affected the results (which is quite possible), you might dyno lower on DL and Tags dyno vs. on the other one. Last edited by bluewater87; 06-16-2013 at 06:58 PM. I was on the stock tune last years max dyno day. All I'm trying to figure out is whether or not you had a tune a week ago at the max dyno day at TAG... because last week at TAG you put down 287whp. -then after sending the stock runs logs to evolve, they sent me a new tune (let's call it rev 2), and I made 305whp at DL motorsports the same day. So what's up with the first rev of that evolve tune then? Could be just that the car was heat soaked at Tag this year, or that the fan they use at tag is **** (IMO it is...), or a number of other reasons as to why my numbers this year were indicated only 2 peak whp higher than last year. It could also be that the new tune evolve gave me is that much different than the first one. I never redynod (at dl) the first tune they gave me, so I don't have the data to analyze what was going on or to compare the two tunes. I will say that the datalink is an awesome tool, and doubt I would (in the future) install a new tune without being able to look at the data. it would be interesting to hear what evolve did between the two tunes. the rev2 tune seems more inline with what you see out there on the net. I saw another local stock frs/brz dyno and it put down 17whp more and 16 ft lbs more (on a diff dyno of course) by comparison to tag. So Im not sure. the guy running the thing did call it the heartbreaker so it would be interesting to see how cars compare on other dynos. Last edited by SiR; 06-18-2013 at 02:32 PM. I think that FR-S had a tune on it. This dyno is not a heartbreaker. See above posts. Note: afr sniffer was not in the exhaust for the stock tune run. Please ignore the stoichometric running at low rpm. This is where the DME goes from closed to open loop and the AFR catches up. If we measure AFR closer to the headers it looks very different. The AFR also goes momentarily rich but again, this is just to do with catching up of the integrators. High rpm we run around 12.8 AFR and because we are running such low ignition targets (16-18 degrees Maximum) the exhaust gas temperatures are nice and low. There is no need to run much more rich than this. I am sure someone will say it's all too lean :-) Before you say this... remember, under 5000rpm these kits make next to no boost at all. The cylinder filling is not great, EGT's are very low and the engine just doesn't benefit from using any more fuel. All that happens is that the fuel flies out of the exhaust and actually bogs the car down. The tuning is based on getting the correct fuel, nice low ignition timing and altering the valve overlap so that the 'boost' is used properly. 1) I did ask for this dyno session to be ideally not on the forums. The kit manufacturers do not like this and I do like to respect their feelings. No one has ever retuned any of our hardware better than us so I have not yet experienced what it feels like. 2) People think we get more power by tuning more aggressively. We do not. The power comes from not running them overly rich and then the valve overlap changes. Ignition timing is extremely low. More power is available than this also but at the expense of the possibility of knock as you venture into the low to mid 20's ignition targets. It just doesn't take into account what happens when things start getting too hot and another sensor is not working. What we are essentially doing is improving efficiency. It's a little like taking a stock S54 and removing timing. Power drops by say 15rwhp. It's a little too far out on the calibration side!! I was referring to tags as being a heartbreaker. Last edited by SiR; 06-18-2013 at 03:53 PM. So was I (as in not being a heartbreaker). I dynoed 285whp stock on both Tags dyno and DL's dyno.